Every once in a while, I come across a piece that stops me in my tracks, and this summer, Mango’s double-breasted blazer is one such item. Thanks to its on-trend hue, nipped-in waist and tortoiseshell buttons, I was immediately drawn to it—look at that unusual retro silhouette and luxe-feel fabric! It’s one of those items no one will believe is from Mango. It did the rounds on our favourite Instagram accounts and unsurprisingly sold out within weeks. I’ve been waiting for Mango to restock the style, and thanks to the store’s ingenious notification system, I just found out it's finally back in stock. But move quickly—they’re being snapped up as we speak. Easily dressed up or down, it lends itself perfectly to this season's head-to-toe beige trend. This is one versatile piece you'll wear all summer. 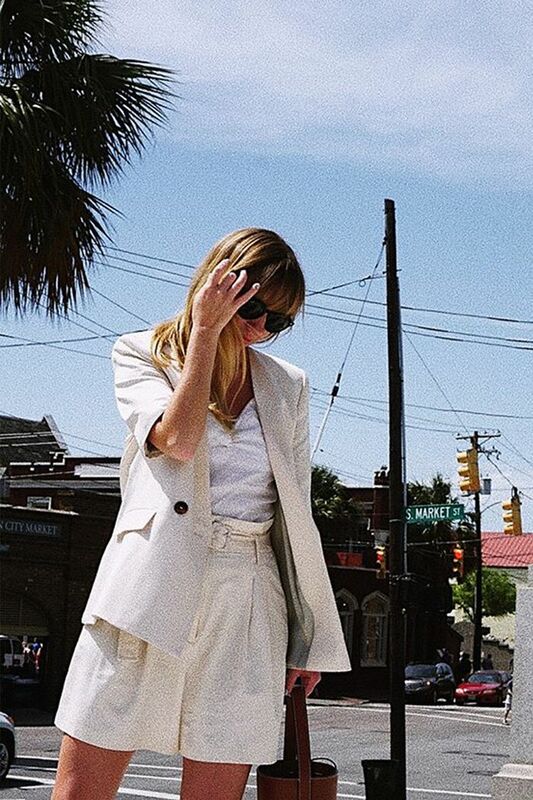 IG is full of styling ideas—Gala González paired her blazer with a skinny belt and linen trousers, while Lisa Aiken layered hers over a white tee with matching shorts. Clean lines and minimalist colourways are clearly the order of the day. Up next: From Ganni to Topshop, the summer sales have never been better.